Autism Spectrum Disorder (ASD) affects millions of individuals in the United States, with 1 in 68 American children currently diagnosed. Individuals with ASD exhibit profound planning deficits, in both motor and language. This study considers how anodal transcranial direct current stimulation (tDCS)—which passes a weak electrical current between two electrodes and facilitates neuronal activity—might be used as a novel rehabilitation technique for children with ASD. Anodal tDCS has been shown to improve motor planning in neurotypical individuals and has been implicated in improving grammar acquisition in children with ASD. Three minimally verbal children with diagnosed or suspected ASD received a low current intensity of tDCS (0.4 mA) for a long duration (90 minutes). Children completed reaction time, balance, and fine motor skill planning tasks before and after receiving tDCS. During stimulation, participants engaged in combined speech/occupational therapy activities. Data collection is limited because of the difficulties in testing this population. However, observations from work have indicated that tDCS is feasible in children with ASD, and tDCS is potentially capable of inducing long-lasting improvements in motor planning and grammar use in children with ASD. Autism Spectrum Disorder (ASD) affects millions of individuals in the United States—current predictions estimate that 1 in 68 American children have ASD . Individuals with ASD exhibit profound planning deficits, in both motor and language  and there is some indication that therapeutic tools can be useful in improving deficits [3, 4]. While diagnostic criteria for ASD include generally impaired speech development and difficulties with both verbal and nonverbal communication , motor abnormalities have also recently become another widely recognized component of the disorder . Decrements in motor and communication abilities can contribute to poor school performance, negative peer interactions, and difficulties finding and keeping jobs, indicating a pressing need to develop effective therapies to address these deficits . This study investigated how a form of noninvasive brain stimulation, transcranial direct current stimulation (tDCS), might be an effective tool to improve both motor and language abilities in this population when used in conjunction with typical therapeutic interventions. Although some controversy persists, motor deficits in ASD are more heavily associated with motor planning (i.e., the ability to organize/sequence actions), as opposed to motor ideation (i.e., developing a concept about how to move) or motor execution (i.e., actually completing the movement) [6, 8, 9]. Motor planning begins before the action is initiated, but continues to control action during the movement, correcting errors and assessing whether the end goal is achieved . In general, children with ASD tend to demonstrate greater “clumsiness,” and reduced motor coordination during both upper and lower extremity tasks . Children with ASD find more difficulty planning their actions during drawing tasks  and are less likely to express end-state comfort tendencies (i.e., the idea that an individual will begin an action in an uncomfortable position if that allows them to end the task in a more comfortable/ functional position) than neurotypical children . Children with ASD also express slower reaction times (RT) and movement times (MT) during reaching movements when compared to neurotypical children [11-13]. Children with ASD find difficulty considering an entire action instead of just the next step. For instance, typically developing children show activation of the muscles required to open the mouth a few hundred milliseconds before picking up a piece of food (indicating their clearly planned intentions to grasp the piece of food, move it towards their mouth, and consume it) . However, children with ASD do not show activation of mouth muscles until the food is actually waiting outside their mouth—suggesting that, although children with ASD are aware of their intention to eat the food, they are not able to translate this intention into a motor sequence that is fully planned out ahead of time . Similarly, children with ASD are less likely to change their movement speed when placing a block into a small vs. a large container, implying that these children experience difficulties taking their final goal account before starting an action . These motor abnormalities seem to appear within the first two years of life, even before the emergence of social and communication difficulties, indicating the potential major role of motor in ASD [16-18]. Motor deficiencies clearly translate to decreased interactions with one’s physical and social world, which can be incredibly detrimental during the critical developmental period of the first two years of life . Thus for those with ASD, focusing on motor control in addition to other deficits may lead to less impairment later in life . Various cortical areas and subcortical areas comprise the corticostriatal tracts involved in generating, planning, and executing motor behaviors. In particular, the supplementary motor area (SMA) is suspected to be highly involved in producing both simple and complex motor behaviors, including involvement in action sequencing (e.g., a person deciding to turn their hand before vs. after picking up a small object), learning (e.g., becoming more accurate at a novel balance task), the executive control of movement (e.g., monitoring for errors and “tuning out” distraction from the environment), and language acquisition (e.g., learning correct grammar use) [20-23]. The SMA is functionally connected with other frontal regions (e.g., primary motor cortex, premotor cortex, and somatosensory area) [24, 25] in addition to subcortical areas via frontal-basal ganglia (BG) pathways (i.e., corticostriatal pathways) . Thus, the significant role of the SMA and its pathways in motor planning make it a potential effective target for motor therapeutic interventions. While the reasoning behind why those with ASD tend to express deficient motor planning abilities remains unclear , possible explanations include decreased connectivity of the motor execution network , as well as abnormal transmission in the serotonergic, dopaminergic, and gamma-amino butyric acid (GABA)ergic systems . Interestingly, structural imaging studies suggest that those with ASD actually have a larger total brain, cerebellar, and caudate nucleus volume; however, the corpus callosum area appears to be reduced in this population, which would decrease interhemispheric communication and could contribute to some of the motor deficits [28, 29]. Abnormalities of BG, thalamus, and SMA functioning have also been suggested as possible sources of motor decrements in ASD . About 20 percent of children with ASD are effectively non-verbal, using less than five words per day . However, language difficulties in ASD appear to be heavily related to grammar abnormalities, while vocabulary/lexical knowledge is less impaired or even enhanced in those with ASD [2, 31, 32]. For instance, children with ASD tend to use less syntactic complexity compared to children with other developmental disabilities and their typically developing peers [33, 34]. Children with ASD also sometimes omit definite articles (e.g., “the”) [35, 36] and are also more likely than their peers to omit inflectional morphemes while speaking (e.g., saying walk instead of walking) [35, 36]. Individuals with ASD sometimes compensate for their grammar deficits through heavier reliance on memorization . Those with ASD often rely on “formulas” to communicate, storing prefabricated phrases as whole entities instead of crafting grammatically varying sentences while speaking [2, 37, 38]. For instance, a child with ASD might use “you’re welcome” inappropriately as a general response to others. Individuals with ASD also often display difficulty with pronouns (e.g., saying “You want to go outside” to convey their own desires). Many structures are involved in the production of language, including the Broca’s area, as well as the supramarginal gyrus, anterior insula, cerebellum, premotor area, primary somatosensory area, and the thalamus . Broca’s area is known to play a substantial role in the planning of speech , in the serial processing of language [40, 41], and in one’s ability to listen to and comprehend language . Additionally, recent functional imaging studies have identified other roles of Broca’s area not specifically related to speech , including involvement in the “mirror neuron system,” which allows individuals to recognize and imitate the actions of others , and motor ideation, planning , and action execution . Broca’s area has recently been associated with corticostriatal pathways, including a pathway that originates in posterior Broca’s area and converges on the anterior putamen of the BG . Moreover, posterior Broca’s area possesses functional connections with the SMA, a region highly implicated in sequencing/planning motor behaviors [39, 47]. Thus, the involvement of Broca’s area in these pathways indicates its potential role in sequencing/ planning for both speech and non-speech behaviors. These roles make Broca’s area a promising target for language (and possibly also non-verbal motor) therapeutic interventions. The abilities to produce both motor behaviors and language rely on two major memory systems—the declarative and procedural systems. The declarative memory system allows humans to learn, represent, and use knowledge about facts (i.e., “semantic knowledge”) and personal experiences (“episodic knowledge”) [48-50], storing almost exclusively explicit knowledge, which allows us to remember the capital of Wisconsin and what was for dinner last night . The hippocampus and nearby structures in the medial temporal lobe are crucial for learning and storing new declarative memories . Portions of the inferior frontal cortex (Brodmann area 45 and 47), portions of the BG that likely project to these frontal areas, and the cerebellum are necessary for selecting, retrieving, and searching for these memories. The procedural memory system subserves the ability to learn novel and control well-established cognitive and perceptualmotor skills (e.g., riding a bike or typing) [2, 50, 51]. The procedural memory system is particularly implicated in learning new rules and sequences, in non-language tasks and in learning the rules of grammar . This type of learning requires repeated exposure to stimuli (i.e., practice), but the learning and retrieving of this knowledge are not accessible to the conscious memory . Procedural memory relies on frontal-BG circuits. In particular, in the frontal cortex, pre-SMA, SMA, and Broca’s area appear to play a large role  and possess functional connections with the BG . The BG, especially the caudate nucleus, seems to be important in acquiring new procedures, while the frontal regions appear to be important for processing these procedures once they have become learned/automatic . The cerebellum and the inferior parietal cortex are also associated with the procedural memory system [52, 53]. The declarative and procedural systems “work together” while learning new knowledge and skills. The declarative system can function in the initial acquisition of knowledge to learn explicit sequences and rules (e.g., the steps to serve a tennis ball), while the procedural system more gradually learns complementary knowledge with practice (e.g., the subconscious information one uses to coordinate both arms during a serve) . Declarative memory underlies the explicit portion of language— the “mental lexicon”—or the innate mental dictionary that includes word-specific knowledge, including simple words (e.g., the arbitrary sound-meaning pairings between “cat” and furry four-legged mammals), irregular word forms, and syntax (i.e., the rules of grammar) . Procedural memory is associated with “mental grammar,” or the regularities of language—the rules that govern how lexical forms and other smaller units of language can combine in the correct sequences and hierarchy to represent complex ideas [2, 50]. Procedural memory aides in the implicit use of the rules that one has learned, including rules about syntax (e.g., “The dog bit the man” vs. “The man bit the dog”), morphology (e.g., jump+ed=jumped), and the sound patterns of words (e.g., c+a+t=cat) [2, 50]. Various abnormal motor and language behaviors often noted in those with ASD indicate dysfunction in various structures and pathways of the procedural memory system. For instance, when trying to learn sequential, multi-step motor skills, individuals with ASD tend to perform much worse than when they are learning simple tasks (e.g., finger tapping) and in comparison to neurotypical controls . Additionally, some individuals with ASD also show hypokinetic (slow) movements, similar to those with Parkinson’s disease [55, 56], and ASD is associated with unsuppressed movements (tics and stereotyped movements) . Both of these symptoms implicate abnormalities of the BG, which is a primary structure associated with the procedural memory system. With regards to language, individuals with ASD experience difficulty trying to learn the correct sequence/hierarchy for arranging words in a sentence [58, 59]. During a visual sentence comprehension task, adults with ASD showed less fMRI activation than age-matched controls in three areas related to the procedural memory system—the left inferior frontal gyrus (i.e., Broca’s area), in addition to less activation in the left lateral/ medial premotor cortex and the pre-SMA/SMA . Similarly, during a positron emission tomography (PET) study of auditory comprehension, subjects with ASD showed reduced activation in Broca’s area and in two nuclei of the BG, suggesting possible abnormally decreased frontal-BG connectivity in ASD . Subjects in this study also showed reduced activation between the left dorsolateral prefrontal cortex (DLPFC) and the right dentate nucleus of the cerebellum, indicating abnormal frontalcerebellar circuitry in ASD as well . Moreover, during neuroimaging studies of grammar processing, individuals with ASD showed both reduced activation and volume in structures of the procedural memory system and increased activation and volume in structures related to declarative memory processes—indicating the compensation that is occurring . The Procedural Deficit Hypothesis (PDH) represents a synthesis of this behavioral and neuroimaging data, suggesting that these abnormalities of the frontal-BG and frontal-cerebellar circuits that subserve the procedural memory system account for the apparent deficits in grammar (but not lexical knowledge) and difficulties with motor planning (especially for highly sequenced motor tasks) that are often seen in ASD [2, 50]. The PDH predicts dysfunction in these circuits in ASD, across multiple channels, although the same channels might not be affected across all individuals, accounting for the heterogeneity seen among those with ASD . Thus, an intervention that targets the cortical/ subcortical areas associated with the procedural memory system should be effective in addressing both the motor planning and grammar deficits in ASD. A form of noninvasive brain stimulation, transcranial direct current stimulation (tDCS) passes a weak electrical current between two electrode sponges, the anode and cathode, placed on the subject’s scalp . Anodal tDCS transiently facilitates (i.e., depolarize) and cathodal stimulation defacilitates (i.e., hyperpolarizes) neuronal resting membrane potential without actually inducing action potentials [63, 64]. Moreover, imaging studies using functional magnetic resonance imaging (fMRI) have indicated that tDCS is capable of reaching subcortical areas . Anodal tDCS may be applied to a specific cortical area to improve the functional connectivity of a given pathway and elicit behavioral changes, such as improvements in motor [66, 67], cognitive , and speech  abilities. While anodal tDCS to the primary motor cortex produces positive motor learning [66-72], very few studies have examined whether tDCS can influence planning for motor or language. Stimulation of the SMA has been suggested as a means to improve the efficiency of motor planning processes. Anodal tDCS to the SMA resulted in improved performance on a visumotor pinch force task , faster premotor reaction time , and earlier movement initiation/decreased inhibition abilities during a wrist flexion RT task . Similarly, tDCS to Broca’s area has been suggested for improving language planning. Anodal tDCS to Broca’s area during the acquisition phase of an artificial grammar task enhances learning/ performance . Similarly, anodal tDCS to Broca’s has also been shown to enhance verbal fluency (both phonemic and semantic fluency) in healthy adults . A few studies have examined tDCS in participants with ASD to address social withdrawal  and theory of mind abilities— indicating the feasibility of applying tDCS to this population . Only one study has investigated the effect of tDCS on language in ASD, finding improvements after anodal tDCS to the DLFPC . Despite this lack of research, tDCS should be particularly beneficial for those with ASD. Decreased production of GABA and glutamate, as well as dysfunctional GABA receptors, has been found in those with ASD . As tDCS is hypothesized to influence both neurotransmitters, tDCS could help to normalize the glutamatergic and GABAergic systems in these subjects . Moreover, a significant body of literature has noted abnormal connectivity in multiple pathways in those with ASD, including decreased functional connectivity in self-representation circuitry, reward circuitry, social brain pathways, the imitation network, the salience pathways, and in motor control networks [26, 28]. As tDCS is hypothesized to affect functional connectivity via a long-term potentiation-like mechanism, this could address low connectivity in the motor and language planning pathways of those with ASD in a lasting manner. No studies to date have tested whether anodal tDCS might concomitantly facilitate both motor planning and language abilities in children with ASD. How might anodal tDCS to improve grammar acquisition affect motor behaviors in children with ASD? This study has included three children (Table 1). Data collection was conducted at the Charlotte, North Carolina branch of the Center for Medical and Brain Sciences. The children involved with this study were being treated by a clinician for grammar acquisition and language problems. The children tested were minimally verbal and had parent-reported ASD, Pervasive Development Disorder, Not Otherwise Specified (PDD-NOS), or suspected ASD. Each participant had received tDCS and speech/ occupational therapy as a treatment intervention every 6-8 weeks for at least 18 months before participating in testing so all subjects were very familiarized with tDCS, the clinician, and the testing location. Table 1: Child demographics, diagnoses, and motor concerns. When families agreed to participate in the study, the parent or caregiver completed a consent form, health history questionnaire, and consent form. The child provided assent. This study was approved by the Institutional Review Board and performed in accordance with the Declaration of Helsinki. Stimulation was delivered to participants using a Dupel iontophoresis device (Empi Inc.). Two electrode sponges (each 25 cm2, Amrex) saturated with sterile saline (0.9% NaCl) were placed on the scalp. In an effort to not disrupt the typical therapy that children were receiving, the location of tDCS was noted but not controlled. This was determined by the physician delivering the therapy, based on each child’s mood and current behaviors. Two children received anodal tDCS to the DLPFC, and one child received tDCS to the SMA as well as the left supraorbital area (Table 2). The cathode was used as a reference lead and placed over the right supraorbital area for all participants. Participants received 0.4 mA of current, which resulted in a charge density of 0.096 C/cm2 at the active electrode for approximately 85 minutes and a total dosage of about 40 mA·min, which is well within safe limits and reached the target current density for each child for that therapeutic session [78, 79]. We chose to utilize a lower current intensity (0.4 mA) than is employed in most tDCS protocols, but for a longer duration of time (up to 85 minutes in a single session) paired with motor/language training to increase the likelihood of producing lasting behavioral benefits [80-82]. Additionally, as external sensations (e.g., itching and tingling) are often detectable by participants at current intensities greater than 0.4 mA , we used a lower current intensity to maximize tolerability in individuals with ASD who might be hypersensitive to external stimuli. Systematic investigations of the behavioral effects of tDCS have been conducted for at least the past 40 years . Protocols for administering tDCS have been comprehensively investigated, and side effects from stimulation are limited to a mild tingling sensation, itching, and fatigue [67, 84]. Only a transient minimal superficial external integumentary physical risk to participants existed, and participants and their parents were fully informed of these risks before beginning the study. Subjects completed multiple motor planning tasks of varying complexity to assess their fine and gross motor skills. The tasks were designed to be age-appropriate for children. Subjects were instructed to walk across a curved balance beam (BSN Gymnastics) in addition to stepping on six raised “river stones” (Gonge) as part of a balance obstacle course (Figure 1). Children were asked to perform a tandem walk across the balance beam—placing one foot in front of the other and attempting to have the toes of the back foot touching the heel of the front foot at each step. Video footage of performance was recorded for later analysis. Variables of interest included total time taken to complete the task, number of mistakes (e.g., stepping off of the beam; not placing one foot directly in front of the other), and effectiveness of the child’s strategy used to complete the task (e.g., extending the arms for balance). Figure 1: (Left) Balance obstacle course. Time to complete, compliance with the task, and errors were noted. (Right) Block board task consisting of 25 slots positioned different angles. Grip used, number of successful lots, and time to complete the board were recorded. Children were instructed to insert 25 wooden blocks of the same size and shape into slots positioned at different orientations on a raised board (Figure 1). Participants were videotaped while performing this task to use for later analysis. Variables of interest included the effectiveness of the grip that children used when picking up the blocks (i.e., whether the grip was consistent with end-state comfort), the number of blocks they were able to successfully place into the slots, and time taken to complete the board. RT measures included a simple reaction time (SRT) and choice reaction time (CRT) task using a MOART Reaction Time and Movement Time Panel (Lafayette Instruments) (Figure 2). Both RT and MT were recorded for each task. During the SRT task, after hearing an auditory stimulus and seeing the stimulus light turn red, participants were instructed to remove their finger from the home key (SRT) and touch a target directly in front of them (MTSRT) as quickly as possible. Figure 2: MOART reaction time and movement time panel (Lafayette Instruments). Black arrow indicates pathway/target for SRT. Gray arrows indicate the two possible targets for CRT. During the CRT task, participants also heard an auditory stimulus and saw the stimulus light turn red, after which they removed their finger from the home key (CRT) and subsequently touched whichever of two targets lit up red as quickly as possible (MTCRT). One target was situated on the ipsilateral side to the individual’s dominant hand, and the other target was on situated on the contralateral side. Both tasks included delays of between one and four seconds between each subsequent stimulus to make the stimulus timing unpredictable. Participants performed five practice trials in order to familiarize them with the tasks  followed by (an attempted) 30 recorded trials for both SRT and CRT. Stickers were placed on the board to clarify the appropriate targets for each task (e.g., “Start at the airplane’s button and touch the train’s button as fast as you can when you hear the beep”). Children completed the motor tasks for about 15 minutes. They then received their defined treatment of tDCS. During tDCS, they received an occupational therapy/speech therapy intervention delivered by a physician that lasted about 85 minutes. The intervention focused on practicing grammar while engaging in active motor activities (e.g., playing in a ball pit, sliding and swinging on a playground, and playing basketball). After tDCS, children performed the same motor tasks again. All children tolerated the tDCS well. However, overall, children did not cooperate well with the tasks. Thus, primarily behavioral/ observational data was recorded. In general, children appeared to exhibit superior direction-following behaviors, improved attention to the tasks, and greater proficiency on the tasks following tDCS. Child behaviors and performance on the tasks are described in Tables 3-6. Table 3: Child behaviors during SRT task before and after receiving tDCS. Table 4: Child behaviors during CRT task before and after receiving tDCS. Table 5: Child behaviors during balance task before and after receiving tDCS. Table 6: Child behaviors during a block board (fine motor planning) task before and after receiving tDCS. After 85 minutes of tDCS to the SMA and/or DLPFC during combined speech therapy, children with ASD performed relatively better on some parameters of motor planning tasks. All three children successfully completed either the same percentage or more SRT and CRT trials after tDCS. Two of the children had a faster SRT after tDCS, and one child had a faster CRT (and one child who refused to try the CRT task before tDCS was able to successfully complete the task after stimulation). Two of the children were more proficient at the balance task after tDCS; the child who performed worse appeared to be exhausted after his therapy, which may have contributed to his worse performance after tDCS. 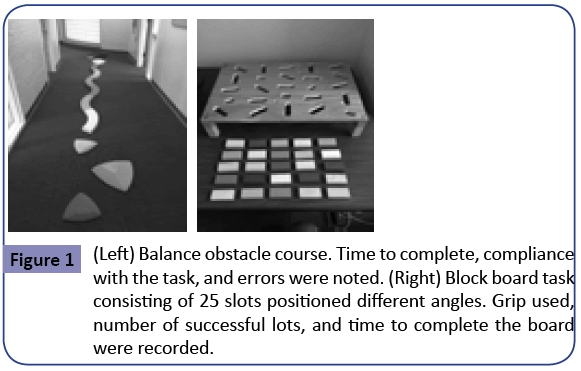 Each child performed more independently on the block board task and showed a greater tendency towards using functional end-state comfort grips after tDCS, and the child who gave up before completing all 25 blocks before tDCS was able to successfully finish the task during the post-test. tDCS may have generally helped improve children’s focus on the tasks and overall performance via enhancing functional connectivity of the frontal-BG pathways, including pathways subserving attention and motor, and thus enhance functionality of the potentially dysfunctional procedural memory system in ASD. Additionally, for the child who received tDCS to the SMA, tDCS might have specifically depolarized neurons associated with the SMA to speed up planning calculations [63, 64], and improved functional connectivity of the SMA’s pathways, cortico-cortico connectivity between the SMA and the primary motor cortex, corticostriatal connections, and SMA-cerebellum connectivity to result in better performance of motor behaviors after stimulation [20, 24, 65, 63, 86]. Thus, the observations of this study suggest that: (1) Applying tDCS to children with ASD is feasible; (2) These motor tasks can be used to provide behavioral/observational data but not reliable quantitative measures of motor planning abilities in children with ASD; (3) tDCS combined with language/motor therapy appears to be at least somewhat beneficial for improving motor planning performance in children with ASD who demonstrate clinical motor deficits. This study faced multiple limitations. A sham (placebo) condition could not be tested on this population because children were receiving tDCS as a therapeutic intervention, and we did not want to disrupt their usual treatment. For future investigation, a sham stimulation condition. As well as neurotypical age-matched controls, should be considered to be included. All three children likely also exhibited a learning effect in the post-test, so a placebocontrolled study would be required to separate the learning effect from the tDCS effect. We did try to control for this as much as possible with familiarization trials before collecting data. Children also did not enjoy completing the tasks. The balance task was not difficult for most of the children; if the balance beam had been raised higher off the ground, this might have encouraged children to proceed more carefully across the beam and follow directions better. The block task was not rewarding to participants and somewhat confusing; we would suggest looking for motor planning in their self-directed play which may include this board or other activities they enjoy. Telling them what to do and how many was not motivating even for rewards. Children found the RT task monotonous and not rewarding; however to get a viable measure needs this type of task and equipment. We suggest having a different task they can complete on a tablet device may have encourage children to consider the task as more of a video game, resulting in higher levels of engagement. Assessing motor planning through RT tasks may not be feasible in this population. Finally, it may be helpful for parents, not researchers, to provide the instructions to their child to create the best chances of the child understanding and complying with the task. Future studies should also potentially focus on collecting more formalized behavioral observations instead of using tasks that require a high level of direction-following and sustained attention, as these types of tasks are less representative of children’s true functional language and motor abilities. Behavioral observation could include assessing children before, during, and after tDCS on the amount of spontaneous speech—particularly correct grammar—they produce, as well as their proficiency at voluntarily completing complex motor tasks (e.g., assessing children’s balance while walking across a seesaw in a playground, but only if they choose to do so themselves, instead of specifically instructing them to walk across a balance beam). Moreover, future studies should focus primarily on stimulation of the SMA and Broca’s area, as these regions are heavily implicated in procedural learning and planning for motor and speech, and these regions might express reduced functional connectivity in ASD [2, 22]. Had we applied tDCS specifically to these areas (instead of the areas determined by the physician and consistent with the child’s typical therapy), we might have seen more specific benefits to motor planning instead of more general behavioral improvements. Future investigations will also emphasize combined motor and speech tasks. For instance, one task might include giving a child blocks that have components of a sentence (e.g., a subject, verb, or article) written on them. Children will then need to arrange the blocks in the correct order to produce a functional sentence and place these blocks into slots on a board at varying angles. This will thus test both grammar abilities (i.e., placing blocks in the correct sequence) and motor planning (i.e., using the correct approach to each slot for end-state comfort). Additional studies should also focus on a long-term intervention and observe variations between stimulating Broca’s area vs. the SMA on planning abilities in both grammar and motor. The authors would like to acknowledge Dr. Harry Schneider of the Brain Function Laboratory at the Yale School of Medicine for all of his contributions to this work. He graciously allowed us to test his patients and provided physician supervision for this study. We will continue close collaborations with him in the future as our investigation into tDCS and ASD progress. CDC (2014) Prevalence of autism spectrum disorders among children aged 8 years: Autism and developmental disabilities monitoring network, 11 sites, United States, 2010. Morbidity and Mortality Weekly Report: Surveillance Summaries 63: 1-22. Walenski M, Tager-Flusberg H, Ullman MT (2006) Language in autism. In SO Moldin JLR Rubenstein (eds.) Understanding Autism: From Basic Neuroscience to Treatment. Boca Raton, FL: CRC Press, pp: 175-203. Carlsen AN, Eagles JS, MacKinnon CD (2015) Transcranial direct current stimulation over the supplementary motor area modulates the preparatory activation level in the human motor system. Behav Brain Res 279: 68-75. Schneider HD, Hopp JP (2011) The use of the Bilingual Aphasia Test for assessment and transcranial direct current stimulation to modulate language acquisition in minimally verbal children with autism. Clin Linguist Phon 25: 640-654. Diagnostic and Statistical Manual of Mental Disorders (2013) Arlington: American Psychiatric Association. Rinehart NJ, Bellgrove MA, Tonge BJ, Brereton AV, Howells RD, et al. (2006) An examination of movement kinematics in young people with high-functioning autism and Asperger’s disorder: Further evidence for a motor planning deficit. J Autism DevDisord 36: 757-767. Sutera S, Pandey J, Esser EL, Rosenthal MA, Wilson LB, et al. (2007) Predictors of optimal outcome in toddlers diagnosed with autism spectrum disorders. J Autism DevDisord 37: 98-107. Fournier KA, Hass CJ, Naik SK, Lodha N, Cauraugh JH, et al. (2010) Motor coordination in autism spectrum disorders: A synthesis and meta-analysis. J Autism DevDisord 40: 1227-1240. Hughes C (1996) Brief report: Planning problems in autism at the level of motor control. J Autism DevDisord 26: 99-107. Gowen E, Hamilton A (2013) Motor abilities in autism: A review using a computational context. J Autism DevDisord 43: 323-344. Glazebrook CM, Elliott D, Lyons J (2006) A kinematic analysis of how young adults with and without autism plan and control goal-directed movements. Motor Control 10: 244-264. Nazarali N, Glazebrook CM, Elliott D (2009) Movement planning and reprogramming in individuals with autism. J Autism DevDisord 39: 1401-1411. Rinehart NJ, Bradshaw JL, Brereton AV, Tonge BJ (2001) Movement preparation in high-functioning autism and Asperger disorder: A serial choice reaction time task involving motor reprogramming. J Autism DevDisord 31: 79-88. Cattaneo Z, Pisoni A, Papagno C (2011) Transcranial direct current stimulation over Broca’s region improves phonemic and semantic fluency in healthy individuals. Cog Behav Sys Neuro 183: 64-70. Fabbri DM, Cattaneo L, Boria S, Rizzolatti G (2009) Planning actions in autism. Exp Brain Res 192: 521-525. Adrien JL, Lenoir P, Martineau J, Perrot A, Hameury L, et al. (1993) Blind ratings of early symptoms of autism based upon family home movies. J Am Acad Child Adolesc Psychiatry 32: 617-626. Provost B, Lopez B, Heimerl S (2007) A comparison of motor delays in young children: Autism Spectrum Disorder, Developmental Delay, and developmental concerns. J Autism DevDisord 37: 321-328. Teitelbaum O, Benton T, Shah PV, Prince A, Kelly JK, et al. (2004) Eshkol-Wachman movement notation in diagnosis: The early detection of Asperger syndrome. ProcNatlAcadSci 101: 11909-11914. Fournier KA, Amano S, Radonovich KJ, Bleser TM, Hass CJ, et al. (2014) Decreased dynamical complexity during quiet stance in children with autism spectrum disorders. Gait Posture 39: 420-423. Nachev P, Kennard C, Husain M (2008) Functional role of the supplementary and pre-supplementary motor area. Nat Rev Neurosci 9: 856-869. Nguyen VT, Breakspear M, Cunnington R (2014) Reciprocal interactions of the SMA and cingulate cortex sustainpremovement activity for voluntary actions. J Neurosci 34: 16397-16407. Ullman MT (2006) Is Broca’s area part of a basal ganglia thalamocortical circuit? Cortex 42: 480-485. Vollman H, Conde V, Sewerin S, Taubert M (2013) Anodal transcranial direct current stimulation (tDCS) over supplementary motor area (SMA) but not pre-SMA promotes short-term visuomotor learning. Brain Stimul 6: 101-107. Bonelli RM, Cummings JL (2007) Frontal-subcortical circuitry and behavior. Dialogues in ClinNeurosci 9: 141-151. Kim DY, Lim JY, Kang EK, You DS, Oh MK, et al. (2010) Effect of transcranial direct current stimulation on motor recovery in patients with subacute stroke. Am J Phys Med Rehabil 89:879-886. Mostofsky SH, Powell SK, Simmonds DJ, Goldberg MC, Caffo B, et al. (2009) Decreased connectivity and cerebellar activity in autism during motor task performance. Brain. Nelson KB, Grether JK, Croen LA, Dambrosia JM, Dickens BF, et al. (2001) Neuropeptides and neurotrophins in neonatal blood of children with autism or mental retardation. Ann Neurol 49: 597-606. Enticott PG, Bradshaw JL, Iansek R, Tonge BJ, Rinehart NJ, et al. (2009) Electrophysiological signs of supplementaryÃ¢ÂÂmotorÃ¢ÂÂarea deficits in highÃ¢ÂÂfunctioning autism but not Asperger syndrome: An examination of internally cued movementÃ¢ÂÂrelated potentials. Dev Med Child Neurol 51: 787-791. Stanfield AC, McIntosh AM, Spencer MD, Philip R, Gaur S, et al. (2008) Towards a neuroanatomy of autism: A systematic review and meta-analysis of structural magnetic resonance imaging studies. Eur Psychiatry 23: 289-299. Lord C, Risi S, Pickles A (2004) Trajectory of Language Development, in Developmental Language Disorders, Rice, M. L. and Warren, S. F. Lawrence Erlbaum Associates, Mahwah, New Jersey, pp: 7-29. Ullman MT (2004) Contributions of memory circuits to language: The declarative/procedural model. Cognition 92: 231-270. Walenski M, Mostofsky SH, Gidley LJC, Ullman MT (2008) Brief report: Enhanced picture naming in autism. J Autism DevDisord 38: 1395-1399. Scarborough HS, Rescorla L, Tager FH, Fowler AE, Sudhalter V, et al. (1991) The relation of utterance length to grammatical complexity in normal and language-disordered groups. App Psycholinguistics: Psych Studies Language Processes 12: 23-45. Tager FH, Calkins S, Nolin T, Baumberger T, Anderson M, et al. (1990) A longitudinal study of language acquisition in autistic and Down syndrome children. J Autism DevDisord 20: 1-21. Bartolucci G, Pierce SJ, Streiner D (1980) Cross-sectional studies of grammatical morphemes in autistic and mentally retarded children. J Autism DevDisord 10: 39-50. Howlin P (1980) The acquisition of grammatical morphemes in autistic children: A critique and replication of the findings of Bartolucci, Pierce, and Streiner. J Autism DevDisord 14: 127-136. Ullman MT, Pierpont EI (2005) Specific language impairment is not specific to language: The procedural deficit hypothesis. Cortex 41: 399-433. Wray A, Perkins MR (2000) The functions of formulaic language: An integrated model. Language and Communication 20: 1-28. Andrewes D (2016) Neuropsychology: From theory to practice. New York, NY: Routledge. Burns MS, Fahy J (2010) Broca’s area: Rethinking classical concepts from a neuroscience perspective. Top Stroke Rehabil 17: 401-410. Clerget E, Arnaud B, Julie D, Etienne O (2011) Role of Broca’s area in motor sequence programming: A cTBS study. Cognitive NeurosciNeuropsych 22: 965-969. Novick JM, Trueswell JC, Thompson-Schill SL (2005) Cognitive control and parsing: Reexamining the role of Broca’s area in sentence comprehension. Cogn Affect BehavNeurosci 5: 263-281. Iacoboni M, Dapretto M (2006) The mirror neuron system and the consequences of its dysfunction. Nat Rev Neurosci 7: 942-951. Thoenissen D, Zilles K, Toni I (2002) Differential involvement of parietal and precentral regions in movement preparation and motor intention. J Neurosci 22: 9024-9034. Parsons L, Fox P, Downs J, Glass T, Hirsch TB, et al. (1995) Use of implicit motor imagery for visual shape discrimination as revealed by PET. Nature 375: 54-58. Ford A, Triplett W, Sudhyadhom A, Gullett J, McGregor K, et al. (2013) Broca’s area and its striatal and thalamic connections: A diffusion-MRI tractography study. Neuroanat 7. Ford A, McGregor K, Case K, Crosson B, White KD, et al. (2010) Structural connectivity of Broca’s area and medial frontal cortex. NeuroImage 52: 1230-1237. Cabeza R, Moscovitch M (2013) Memory systems, processing modes, and components: Functional neuroimaging evidence. PerspectPsycholSci 8: 49-55. Eichenbaum, H (2012) The cognitive neuroscience of memory: An introduction New York, NY: Oxford University Press. Ullman MT (2013) The role of declarative and procedural memory in disorders of language. Linguistic Variation 13:133-154. Willingham DB (1998) A neuropsychological theory of motor skill learning. Psychol Rev 105: 558-584. Hikosaka O, Nakahara H, Rand MK, Sakai K, Lu X, et al. (1999) Parallel neural networks for learning sequential procedures. Trends Neurosci 22: 464-471. Squire LR, Zola SM (1996) Structure and function of declarative and nondeclarative memory systems. ProcNatlAcadSci 93: 13515-13522. Minshew NJ, Goldstein G, Siegel D (1997) Neuropsychologic functioning in autism: Profile of a complex information processing disorder. J Intl Neuropsych Society 3: 303-316. Mari M, Castiello U, Marks D, Marraffa C, Prior M, et al. (2003) The reach-to-grasp movement in children with autism spectrum disorder. Philos Trans R SocLond B BiolSci 358:393-403. Vilensky JA, Damasio AR, Maurer RG (1981) Gait disturbances in patients with autistic behavior: A preliminary study. Arch Neurol 38: 646-649. Ringman J, Jankovic J (2000) Occurrence of tics in Asperger's syndrome and autistic disorder. J Child Neurol 15: 394-400. Chomsky N (1995) The minimalist program Cambridge, MA: MIT press, p: 28. Lees RB, Chomsky N (1957) Syntactic structures. Language 33: 357-408. Just M, Cherkassky V, Keller T, Minshew N (2004) Cortical activation and synchronization during sentence comprehension in high-functioning autism: Evidence of underconnectivity. Brain 127: 1811-1821. Müller RA, Behen ME, Rothermel RD, Chugani DC, Muzik O, et al. (1999) Brain Mapping of Language and Auditory Perception in High-Functioning Autistic Adults: A PET Study. J Autism DevDisord 29: 19-31. Jankovic J, Tolosa EE (2007) Parkinson’s Disease and Movement Disorders Baltimore, MD: Lippincott Williams Wilkins. Filmer HL, Dux PE, Mattingley JB (2014) Applications of transcranial direct current for understanding brain function. Trend Neurosci 37: 742-753. Nitsche MA, Fricke K, Henschke U, Schlitterlau A, Liebetanz D, et al. (2003) Pharmacological modulation of cortical excitability shifts induced by transcranial direct current stimulation in humans. J Physiol 553: 293-301. Polanía R, Paulus W, Nitsche MA (2012) Modulating cortico-striatal and thalamo-cortical functional connectivity with transcranial direct current stimulation. Hum Brain Mapp 33: 2499-2508. Boggio PS, Castro LO, Savagim EA, Braite R, Cruz VC, et al. (2006) Enhancement of non-dominant hand motor function by anodal transcranial direct current stimulation. NeurosciLett 404: 232-236. Madhavan S, Weber KA, Stinear JW (2011) Non-invasive brain stimulation enhances motor control of the hemiparetic ankle: Implications for rehabilitation. Exp Brain Res 209: 9-17. Miniussi C, Cappa SF, Cohen LG, Floel A, Fregni F, et al. (2008) Efficacy of repetitive transcranial magnetic stimulation/transcranial direct current stimulation in cognitive neurorehabilitation. Brain Stimul 1:326-336. Galea JM, Celnik P (2009) Brain polarization enhances the formation and retention of motor memories. J Neurophysiol 102: 294-301. Hunter T, Sacco P, Nitsche MA, Turner DL (2009) Modulation of internal model formation during force field-induced motor learning by anodal transcranial direct current stimulation of primary motor cortex. J Physiol 587: 2949-2961. Nitsche MA, Schauenburg A, Lang N, Liebetanz D, Exner C, et al. (2003) Facilitation of implicit motor learning by weak transcranial direct current stimulation of the primary motor cortex in the human. J Cognitive Neurosci 15: 619-626. Reis J, Schambra HM, Cohen LG, Buch ER, Fritsch B, et al. (2009) Noninvasive cortical stimulation enhances motor skill acquisition over multiple days through an effect on consolidation. ProcNatlAcadSci 106: 1590-1595. Hayduk CG, Drummond NM, Carlsen AM (2013) Anodal tDCS over SMA decreases the probability of withholding an anticipated action. Behav Brain Res 257: 208-214.
de Vries MH, Barth ACR, Maiworm S, Knecht S, Zwitserlood P, et al. (2010) Electrical stimulation of Broca’s area enhances implicit learning of an artificial grammar. J Cognitive Neurosci 22: 2427-2436. D’Urso G, Bruzzese D, Ferrucci R, Priori A, Pascotto A, et al. (2015) Transcranial direct current stimulation for hyperactivity and noncompliance in autistic disorder. World J Biol Psychiatry 16:361-366. Santiesteban I, Banissy MJ, Catmur C, Bird G (2012) Enhancing social ability by stimulating right temporoparietal junction. Current Biology 22: 2274-2277. Boggio PS, Asthana MK, Costa TL, Valasek CA, Osorio AAC, et al. (2015) Promoting social plasticity in developmental disorders with non-invasive brain stimulation techniques. Front Neurosci 9: 294. Kenet T, Orekhova EV, Bharadwaj H, Shetty NR, Israeli E, et al. (2012) Disconnectivity of the cortical ocular motor control network in autism spectrum disorders. NeuroImage 61: 1226-1234. Liebetanz D, Koch R, Mayenfels S, Konig F, Paulus W, et al. (2009) Safety limits of cathodaltranscranial direct current stimulation in rats. ClinNeurophysiol 120: 1161-1167. Ardolino G, Bossi B, Barbieri S, Priori A (2005) Non-synaptic mechanisms underlie the after-effects of cathodal transcutaneous direct current stimulation of the human brain. J Physiol 568: 653-663. Brunoni AR, Nitsche MA, Bolognini N, Bikson M, Wagner T, et al. (2012) Clinical research with transcranial direct current stimulation (tDCS): Challenges and future directions. Brain Stimul 5: 175-195. Nitsche MA, Paulus W (2000) Excitability changes induced in the human motor cortex by weak transcranial direct current stimulation. J Physiol 527: 633-639. Priori A (2003) Brain polarization in humans: A reappraisal of an old tool for prolonged non-invasive modulation of brain excitability. ClinNeurophysiol 114: 589-595. Poreisz C, Boros K, Antal A, Paulus W (2007) Safety aspects of transcranial direct current stimulation concerning healthy subjects and patients. Brain Res Bull 72: 208-214. Pascual LA, Brasil NJ, Valls SJ, Cohen LG, Hallett M, et al. (1992) Simple reaction time to focal transcranial magnetic stimulation. Comparison with reaction time to acoustic, visual and somatosensory stimuli. Brain 115: 109-122. Hamada M, Hanajma R, Terao Y, Okabe S, Nakatani ES, et al. (2009) Primary motor cortical metaplasticity induced by priming over the supplementary motor area. J Physiol 587:4845-4862.